Wasn't I just blogging the other day about how much we enjoy costumes and themes around my house? You can find a huge assortment of kids Halloween costumes through Costume Discounters and I had a hard time choosing just one (they have wonderful baby costumes too!). I probably spent an hour searching through their adorable boy's costumes - I was especially drawn to the Harry Potter robes (but Pierce isn't, as of yet, into Harry Potter). I decided ultimately on Shaggy, from Scooby Doo, because Pierce already has a Scooby Doo costume, which he wore for Halloween. My thinking was that eventually the twins could go as Scooby Doo and Shaggy together, which would be totally cute. 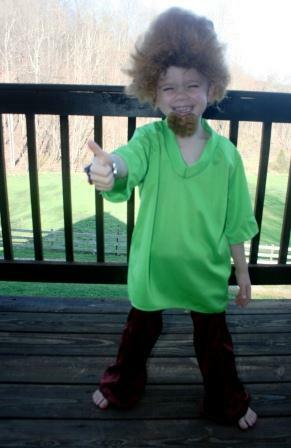 And until that time, Pierce could enjoy dressing as Shaggy -- plus this would be a perfect costume if they ever have a 70s or Disco themed day at Pierce's school! Pierce was thrilled with his costume - he especially liked sporting the goatee and wig. He was actually disappointed when he had to take off his goatee to eat dinner. Lucky for me, he doesn't know that they also carried Super Mario and Buzz Lightyear costumes, because he certainly would've wanted to try those out as well! The sizing was a little large for Pierce. He is very small for his age, so in this particular case I probably should've ordered a size down. We're going to hang on to it, since I know eventually he'll grow into it, but we did receive information with the costume on their easy steps for free size and product exchanges. You can also follow Costume Discounters on twitter to learn about their other great discounts. Their prices are very affordable and they often have items on clearance. Costume Discounters has been generous enough to offer a $25 gift code to one reader! There are TONS of costumes priced at $25 or less, so you are sure to find something you love. This is a Rafflecopter giveaway, so just click on the 'read more' under my signature to enter. Good luck! Disclaimer: I received one item of my choice in exchange for a review. The opinions stated above are my own. The twins would be really cute in Harry Potter robes. They have to be my favorite. That place has great prices! Jessie from Toy Story 2+3. So cute! He really looks like he's enjoying himself! Any kid who dresses up for fun is my kind of kid! Hmmm, I don't know Shaggy, the girls aren't into Scooby. But Pierce does remind me a bit of the Reverend Al Sharpton getting ready to hold forth on something! That is so cute!! Love it!!! Halloween is my fave time of year!! Love costumes too! Hi Lisa, You are just so creative --which is showing up in your children. Pierce looks great as Shaggy. I love the wig and goatee too.... Precious!!!!! Not interested in the Giveaway --but it looks great. That is hysterical and what is even funnier is that my husband saw the pic over my shoulder and knew who he was dressed up as! Love it!! So funny!!! He looks adorable! How fun that Pierce likes to dress up! Hey! That's not a Shaggy costume, that's a Chris costume!!! I love the Batman costume!! I like the child Miss Liberty costume! I like the tween lady gaga constume.. My stepdaughter woudl LOVE that one !! My favorite is the toddler spider man muscle costume. How cool! I like the classic Rapunzel costume! I like the kid's flower power costume! I love the Thor costume! I would get the Kids Plum Pixie Costume Item: R18088.